Some land is easy to classify as pre-1990 or post-1989 forest land. 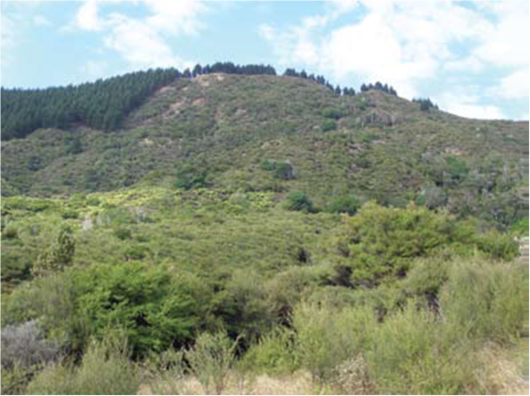 However, for forests that were established on scrub land, the classification is not always obvious. If exotic forest was established after 1989 on land similar to what is shown in the photo above, is it pre-1990 or post-1989 forest land under the ETS? This is an important question as many forest owners established thousands of hectares of exotic forest in the 1990s on land cleared of regenerating manuka or kanuka. In all likelihood it would be classified as pre-1990 forest land even though it was first established in exotic species subsequent to 1990. This would mean the land is eligible for the one-off allocation of carbon credits (the "free" allocation) rather than be eligible to enter the ETS as post-1989 forest land. The risk is that forest owners thinking they have post-1989 forest land could attempt to register it into the ETS and get declined on the basis that it is pre-1990 forest land. If this happens late in 2011 they will then be too late to apply for the 50 ha exemption or the one-off allocation. Alternatively, forest owners with this sort of forest land may not attempt to register the forest land into the ETS and go ahead and convert it to another land use after harvesting, only to find they are liable for the deforestation liability that is now imposed on pre-1990 forest land. And they didn't apply for, and therefore didn't receive, the one-off "free" allocation of carbon credits. So it is important to determine this type of forest land's ETS status prior to the 30 September 2011 deadline for the less than 50 hectare exemption or the 30 November 2011 deadline for the "free" credit allocation applications. Following are some guidelines to help you decide the land classification. If the indigenous forest species on the cleared land were 5 metres in height and formed at least 30% tree crown cover on any given hectare at the 31 December 1989, then this land is pre-1990 forest land and is entitled to the pre-1990 credit allocation if exotic trees were the predominate species on 31 December 2007. But what if the indigenous forest species hadn't yet reached 5 metres in height or formed at least 30% tree crown cover on any given hectare at the 31 December 1989? In this situation it all comes down to how that land was being managed on this date. If the land management practices being carried out at the time were preventing regeneration of forest (e.g. grazing, spraying, scrub cutting, fire), then the subsequent exotic forest would be eligible to enter the ETS as post-1989 forest land (note that MAF would probably require evidence that these land management practices were taking place on the land in question). If the land management practices as at 31 December 1989 were not preventing the regeneration of forest, then the subsequent exotic forest would be eligible for the pre-1990 credit allocation or, if eligible, the less than 50 hectare exemption (again MAF would probably require evidence). It is our view that much of the regenerating manuka or kanuka cleared in the 1990s and established in exotics fits this description. If you require assistance in determining the status of your forest land under the ETS, you will find the following links useful. If you would like assistance in claiming your one off allocation of pre-1990 carbon credits or less than 50 hectare exemption, please email Colin Hercus at Colin.Hercus@pfolsen.com. Trading of NZUs in October continued to be slow with an estimated 800,000 units traded (Agrifax). The price continues to strengthen and is now in the low to mid $20 range. The Government has started to issue NZUs under the pre-1990 forestry allocation and to fisheries and Energy Intensive and Trade Exposed industries and these appear to be coming onto the market, which will be welcomed by the buyers. Forward sales of NZUs are also occurring as buyers attempt to secure post-1989 units that will be issued early next year prior to their emissions surrender deadline of the 31 May 2011. How high will the NZU price go? We all know about the $25 effective cap the Government has imposed, but now there is potentially a new cap that will limit the price to less than $25 in the short term; that of CERs. CERs (Certified Emission Reductions) are units issued to emission reduction projects in developing countries that do not have an emissions cap under the Kyoto Protocol e.g. India and China. Emitters in New Zealand can purchase CERs on overseas markets to meet their emissions liabilities in New Zealand. Up until recently they have been trading over NZ$25, but due to a drop in the CER price on the European market and a strengthening NZD against the Euro, CERs have come down to NZ$21.50. Emitters are not going to buy NZUs for more than what they can purchase alternative compliance credits. While they sell at under NZ$25, CERs have become be an effective cap on the NZU price.